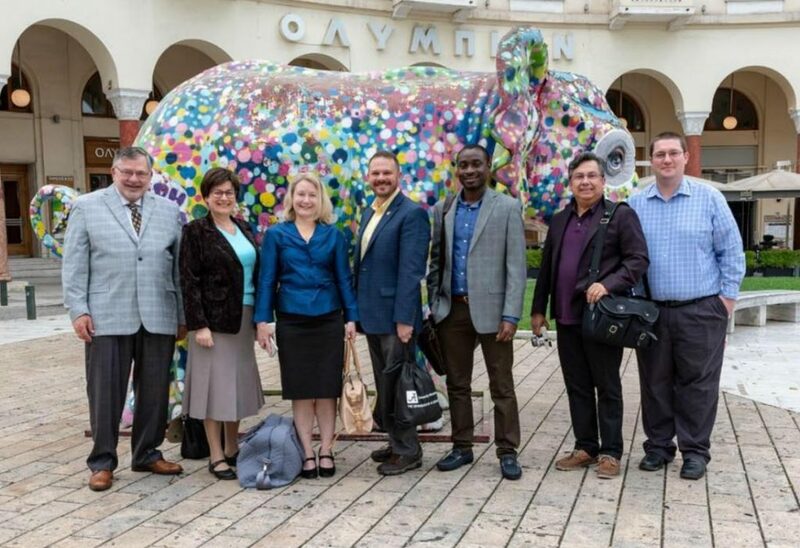 Dean Olin (pictured above, at left, with some of the members of UA’s May 2018 faculty team who visited Thessaloniki for a week of collaborative work) again invited proposals from faculty in the College of Arts & Sciences who are interested in bringing an Aristotle University colleague to Tuscaloosa in either Spring or Summer 2019, to further a collaborative project. Like 2016-17, when a group of UA faculty brought AUTh collaborators to Tuscaloosa in the Spring/Summer 2017 semesters, this call was for sponsoring visitors from Greece who are working with A&S faculty on either ongoing or new collaborative projects. That means that previous participants in the AL/Greece initiative, as well as A&S faculty who have not yet participated, were able to submit proposals through the online system. on Monday, November 5, 2018. Applicants will be notified later in the Fall 2018 semester concerning those selected to participate in the 2019 phase of the Initiative.